Sony announced the discontinuation of the Walkman. Like Christopher Hickey of Salon, I was surprised that they were still making them. Of course the world is not developed economies, so there is/was a market for them. Throughout Hickey’s article, he linked to Walkman Central to highlight different models. It’s a site cultivated with the love and obsession that makes the Internet proud. Poking around I came a cross the PS-F9, portable phonograph. Ultimately impractical, it was only made in 1983. It featured next and previous song controls, and of course the exposed record and vertical orientation. 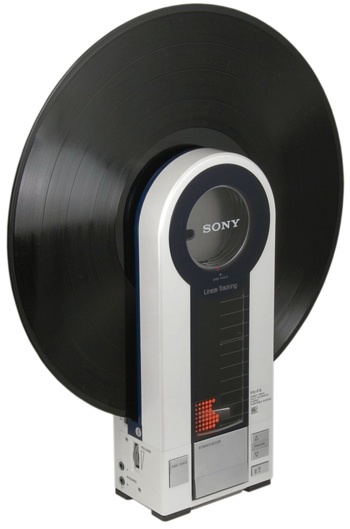 I’d love to have one of these, and put it next to a Teac X-2000R, but the only vinyl records I own are a possibly scratched “Ghostbusters” soundtrack and a sealed copy of R.E.M.’s “Monster”. Borrowing albums from my parents isn’t really an option, because with the notable exceptions of James Taylor’s “Sweet Baby James,”, and “The Johnny Cash Show“, I’d be left with Englebert Humperdinck, the symphonic Beatles, and a “Teach Yourself Polish” album sans workbook. Well that’s not entirely true, there is “Tom Jones Sings She’s a Lady”, but it is quite a sad collection. This entry was posted in architecture / furniture, tech and tagged cassettes, music, records, sony, vinyl, walkman on November 7, 2010 by jonathan. Mike Thompson‘s latest project, Latro, again examines using biology as an energy source. 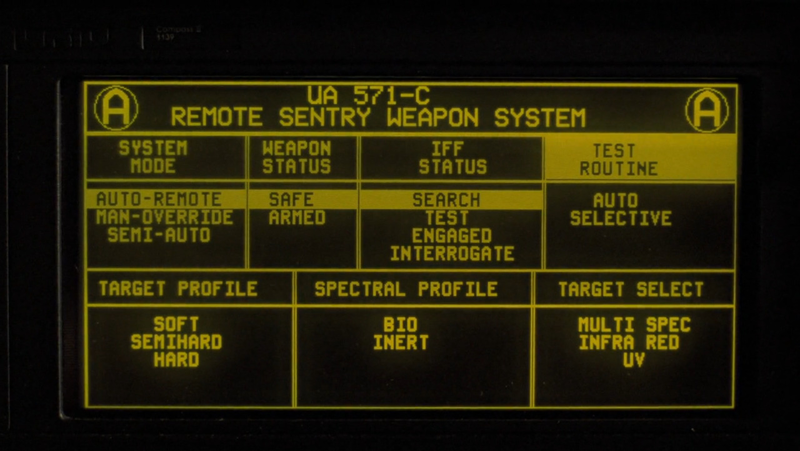 Actually, it’s not really a device at all, but rather simply a mock up of a device. According to the detailed description Latro uses 30-nanometer gold electrodes to extract electrical current from the chloroplasts of algae. Like his previous work, owners must consider the source of the energy they are receiving. Before they had to make a cost-benefit calculation, and now they must maintain and care for the energy source. The Yansei/Stanford team that inspired this work successfully drew a currents of between 1.2 – 12 pA depending on light intensity. Thompson points in terms of amps per area, this is 0.6 – 6.0 mA/cm2. Photovoltaic cells currently operate at about 35 mA / cm2. Extracting a few electrons from photosynthesis is interesting, but it’s hard for me to think of how this could scale to anything beyond a lab bench curiosity, since you need a nanowire in each chloroplast you want to siphon from. So why do this? The Yansei/Stanford team wasn’t actually trying to create a power source, but rather wanted to study electron transfer in photosynthesis. Clearly, photosynthesis extraction isn’t going to to replace photovoltaics, but it is interesting to think of a world where technology has biological components. Say <biological neural networks to solve complex problems. 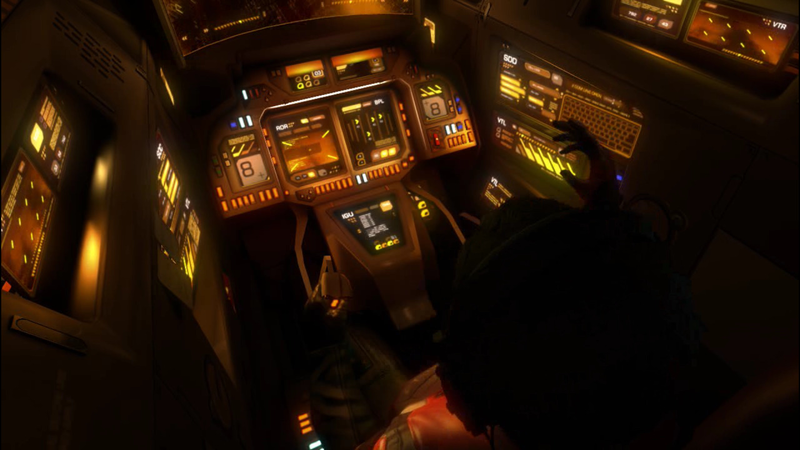 A sort of biopunk world, or perhaps just Star Trek circa 2370. 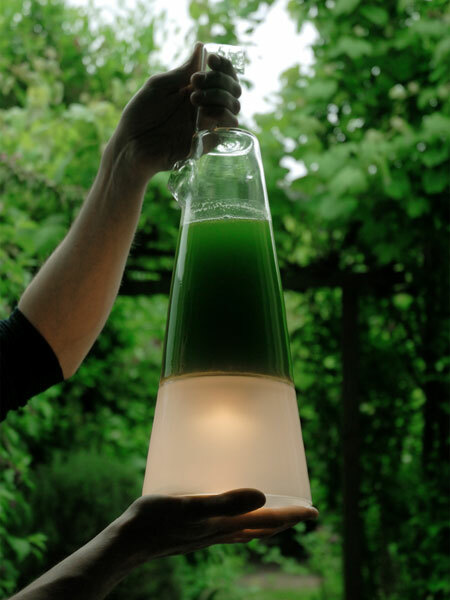 This entry was posted in tech and tagged algae, biology, designfiction, fuelcells, lamps, mikethompson on November 5, 2010 by jonathan. 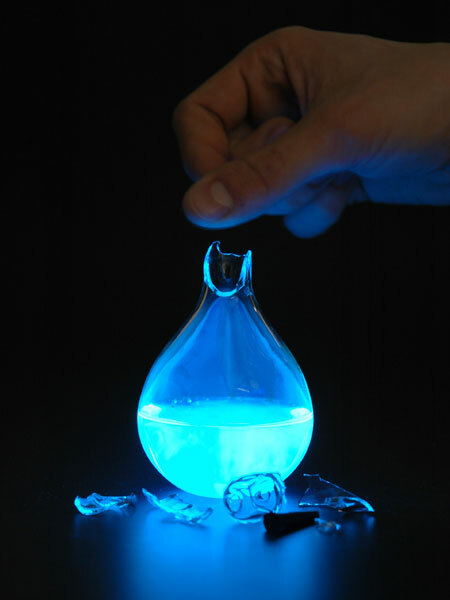 Mike Thompson‘s Blood Lamp is a sealed flask containing luminol. When the owner finds himself in need of light, the neck is broken, and the owner uses the jagged edge to cut his finger and drip blood into the liquid contained in the flask. On a superficial level, the lamp looks like something out of Zork, or something out of an alchemical lab. (Funny, how “menstrual blood of a virgin” is never a magical ingredient. It would be in my magical world.) Thompson says his intention was to bring awareness to how much energy is consumed by each person in a year, and this work does do that in a way that only art can. The other thing that I like about this work is that it uses blood as an energy source. Like many people, I’ve fantasized about blood powered medical implants, and wondered how such implants would effect the patient’s appetite and energy levels. Earlier this year, an implantable glucose powered fuel cell was tested. Recreating the glucose fuel cell, is probably difficult to make at home, but a blood lamp can be made with a simple order of luminol from online suppliers. Place a solar cell around the luminol, and very inefficient blood powered device can be yours. This entry was posted in tech and tagged biology, blood, fuelcells, lamps, mikethompson, video, zork on November 2, 2010 by jonathan.